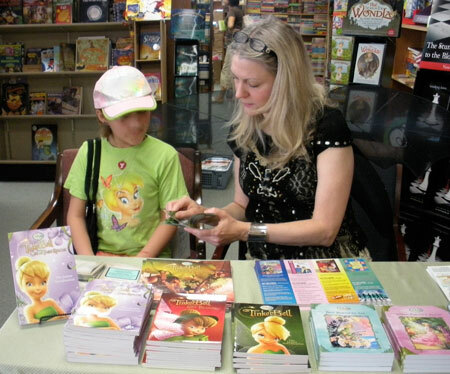 With more than 60 books to her name, children’s author Kimberly Morris is one of the writers behind popular series including Disney Fairies, Sweet Valley Twins and The Unicorn Club. Morris penned scripts for four children’s shows: ThunderCats, SilverHawks, TigerSharks and MiniMonsters. Her publishers and producers include such prominent names as Bantam, Jim Henson Associates, Rankin/Bass Productions and MacMillan U.K. 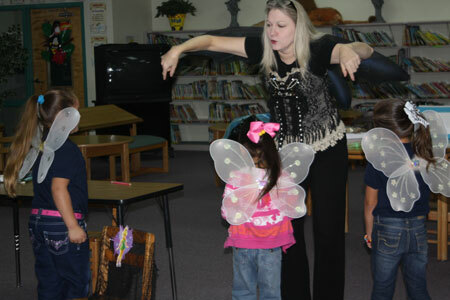 When she’s not writing, the Texas-native author is working at her custom publishing company or on the road as a speaker and workshop presenter in schools and corporate settings. Morris has shown students across the United States that reading is magical and being creative can be exciting and satisfying. Without further ado, the talented Kimberly Morris! 7 Magic Islands: Thank you for answering a few of our questions! Let’s turn back the clock for a moment. According to your websites, you started your writing career in television with series like ThunderCats and MiniMonsters. What compelled you to switch to writing books? I was a freelance writer, and when you work on a TV show or a publishing project, at some point, it’s over and you’re out of work. Shortly after that, you’re out of money. So, when the next opportunity comes along, you jump on it. The writing styles and creative challenges are always different with a new project or a new medium. But that’s what makes this kind of work fun. 7 Magic Islands: How are the writing styles different? Was it an easy transition? 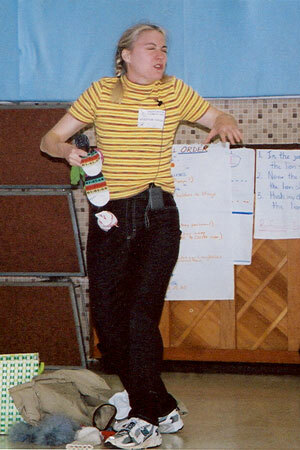 Kimberly Morris: My writing “training” was writing songs – musical theater, pop, country, rock and so on. I was in the ASCAP and BMI workshops in New York City for 3 years and got a lot of great training in craft. Those workshops were very rigorous and there was a lot of emphasis on technique. Once you develop strong technique and a commitment to craft, you can tackle a broad range of projects with confidence. Confidence is actually a lot better than ease. When it gets too easy, it’s not as much fun. 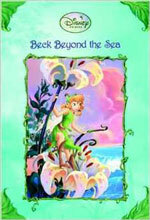 7 Magic Islands: Many of our readers have children who are fans of the Disney Fairies series. We know you’ve written for some big names in TV and books. How did you start writing for Disney and what has that meant to you? Kimberly Morris: Most projects come by way of an editor who has recommended me to another editor. By the time I started writing for Disney, I’d worked with a lot of different editors. 7 Magic Islands: The Disney Fairies live in a fantastical, magical land very different from our world. And yet, the way the characters handle conflict in the story makes them not so different from us after all. Which character in the Disney Fairies series do you relate to the most and why? Kimberly Morris: I think my favorite character is Beck – mainly because I’m an animal fan. But Beck likes people, too. It’s not like she’s a cranky cat lady who doesn’t have a phone and won’t let anybody in house. 7 Magic Islands: You have eight books in the Disney Fairies series to your name: The Case of the Missing Everything, Rani and the Three Treasures, Queen Clarion’s Secret, Beck Beyond the sea, TinkerBell, TinkerBell and the Lost Treasures, TinkerBell and the Great Fairy Rescue, and Fairy Rescue Team. Of these books, which was your favourite to write and why? Kimberly Morris: Probably Beck Beyond the Sea. A) Because I like Beck. And B) It was the first Disney Fairies book I wrote, so it was the freshest challenge. 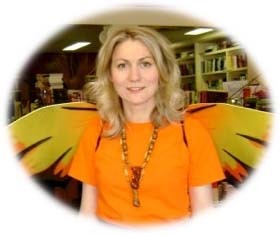 7 Magic Islands: Children all over the world have read your books, be it through the Disney Fairies or one of the many other series on which you’ve worked. How much did you read as a child? Kimberly Morris: I read a lot as a child. My favorite children’s book was Harriet the Spy. I still read it about once a year and it still makes me laugh. I loved the Edgar Eager books – Half Magic, etc. I liked myths and legends. I loved the classic kids books like A Little Princess and A Secret Garden. Also, books that weren’t for kids but were about kids – Great Expectations and David Copperfield. When I was growing up, there really were no “YA” (young adult) books as we understand the category today. Once you graduated from children’s books, you just read whatever adult books you found interesting. 7 Magic Islands: If you were a child again and were to read your books, which do you think would be your favourite? Why? Kimberly Morris: Wow! That’s a great question. Nobody’s ever asked me that before. Let’s see…I think I would probably like the three books I wrote for a series called Making Friends (Macmillan UK) under the pseudonym Kate Andrews. That was a very witty series, and I always liked books that made me laugh. 7 Magic Islands: You’ve written books and stories for children of all ages. You wrote Read-Aloud stories about Fraggle Rock and the Muppets to middle-grade novels like the That’s So Raven series and Animorphs (ghostwritten as K.A. Applegate) to Changes Romances for young adults. What’s your process for deciding what’s appropriate for each audience? Kimberly Morris: When you’re working with licensed characters, or writing for a series, the “voice” and “style” is already established and your job as a writer is to tell stories in that voice and that style for that reader or that viewer. You get what is called a “writer’s bible” – which tells you the who, what, when, where and why of the world you’ll be writing for. Once you digest all that information, you have a pretty good understanding of what is or isn’t appropriate. If it’s a standalone novel – not part of a series – you write the book the way you think best, and let your agent or editor figure out where it belongs in the marketplace. 7 Magic Islands: Children clearly play an important role in your life as an author. If we may get personal for a moment, do you have children of your own? How do children inspire you as a writer? Kimberly Morris: I don’t have any children – but I do have two dogs. Children are fun and funny, but for me, it’s grownups that inspire the best kid characters. It’s amazing how childish many adults are. If children had any idea at all how clueless most grownups are, they would NEVER listen to us. And they’d be justifiably terrified by what we might do next. (So let’s not tell them.) Most of the time, I just “miniaturize” a childish adult and voila! – I have a great kid character that’s funny and interesting. They have the emotions and aspirations of a child, and the planning and execution abilities of an adult. This can make them wonderfully lovable, fiendish, and fallible. 7 Magic Islands: Of your books, there’s one project that’s unlike the others – Just For Now: Kids and the People of Court. This is a collaborative work between yourself and 250 professional and volunteer advocates for children. How did the idea for the book come to be? What was the experience like collaborating with the advocates? Kimberly Morris: The idea came from two Child Advocates, Inc. volunteers, Jackie Crowley and Barbara Abell. 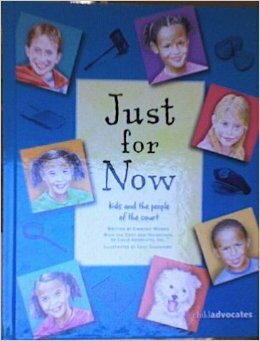 These two incredible ladies understood that the people who advocated for children in the CPS or foster care system needed a book that would explain complex legal processes to the children and families involved. They got everybody organized, raised the money, lined up the participants, and kept the project on track through thick and thin. It was hugely collaborative and involved the creative participation of 250 volunteers and professionals. It was a great experience and I urge anyone with an interest in advocating for children to get involved with the CASA (Court Appointed Special Advocate) chapter in their area. 7 Magic Islands: Is your writing always collaborative? Kimberly Morris: I would say that every writer’s work is collaborative whether they realize it or not. Every writer learns and borrows story material from the writers who came before her going all the way back to the cave. It’s true on the broad cosmic level, and it’s also true in the quotidian day-to-day world of content production. It takes a LOT of very talented and skilled people to get a creative project over the finish line. You might never see or hear their names, but there are editors, publishers, artists, designers, producers and marketers that all play a role in getting an idea out of one person’s head, and turning it into a publishable book, play, CD, or whatever that can be enjoyed by others. 7 Magic Islands: In addition to visiting whole new worlds and capturing imaginations, reading stimulates the mind in both children and adults. How do you feel your writing helps your audience become better readers? Kimberly Morris: My job is to write books that are as entertaining as possible. I think if kids regard reading as a pleasurable activity, they’re likely to do more of it. Reading is like anything else – the more you do it, the better at it you become. 7 Magic Islands: Speaking of the creative process and interest in reading, your presentations at schools are very well-received! From “Writing is Magic,” for your younger audience and supported by Disney Fairies books, to “Journeys and Adventures: The Inside Story” for grades 4 through adulthood, your website lists several great reviews. How did the idea of writing workshops come to be? Kimberly Morris: It’s like standup comedy. It takes a long time to get that 45-minutes of material that “works.” At first my presentations were terrible and boring. I told kids all about me. How I do this. How I do that. Blah blah blah. They were literally snoring. Then I realized that kids aren’t particularly interested in grownups no matter what they do. But they are interested by the grownups who are interested in them. If I couldn’t help THEM be better writers or readers, what was the point? Everybody learns by doing, so that meant the workshops needed to be interactive. Less about me. More about them. It was a process involving a lot of trial and error, and to those early audiences who were bored or baffled, I extend my apologies. 7 Magic Islands: Through your presentations and writing workshops and all your books for children and young adults, you share your passion for the written word and the creative writing process. What’s the key to igniting that same enthusiasm for reading in students? Kimberly Morris: Everybody – kids and grownups – knows a whole lot more about story and structure than they realize. This means they already have what it takes to become good writers and readers. They need to relax, have fun, and quit thinking that it’s rocket science or some mystical process or a cage match with grim death. My workshops demystify the process and help people tap into what they already know. Reading and writing are supposed to be fun – at least when you start. So I make it fun, and in the process, I manage to teach people a heck of a lot in 45 minutes. 7 Magic Islands: You’ve somewhat changed gears from author and presenter to publishing executive. You’re the founder and director of project development for Publishing Matters, a custom publishing company that produces books and printed materials for fundraisers, education and marketing for non-profit organizations. How did Publishing Matters come to be? Kimberly Morris: PM has evolved a lot since its inception. It’s not just about printed matter. And it’s not just about nonprofits or education. It’s about content, in all forms and formats. And it’s about facilitating creative expression. There are lots of projects and meetings that don’t fit into a traditional publishing or writing instruction category, but they are interesting, profitable, fun and worthwhile. Publishing Matters is a vehicle for doing those projects. The end result might be a book. It might be a website. It might be a customized facilitated workshop. For many people, the experience of working on something that is creative or collaborative is enriching and not something they get to do on a daily basis. Figuring out what that collaboration is, how it works, and what the end result looks like, is what Publishing Matters does. 7 Magic Islands: Between your presentation work and your position with Publishing Matters, you’re clearly a very busy woman. It’s been a few years since you’ve published a book, according to our research. Do you have any plans for your future as an author? Kimberly Morris: Always! I’m working a couple of books – one is a “dystopian YA” (Yeah! I know. Me and everybody else.) The other one is a funny series for tweens. And I recently did some story work for a computer game company – which was really interesting and I hope to do more. I find myself coming full circle – moving back to where I started. Over the last two years, I have spent most of my creative time on music, lyrics, theater – and stuff that rhymes. The result is that I’m working on a children’s book with illustrator and designer Seymour Chwast – which is totally an honor and a thrill. It’s about hats. And it rhymes. I’ve also spent a lot of time on my own “American Songbook” – rearranging traditional melodies, reworking them, finding new and interesting variations on old themes, and weaving them into a theatrical story. As for Publishing Matters – I enjoy doing manuscript evaluations and I will soon have a site set up for marketing critique services. 7 Magic Islands: Writing, publishing and presenting must take up a great deal of your time. When you’re not working, how do you like to spend your days? Kimberly Morris: I like to read. I like to sleep. I like to eat. I like to binge watch TV shows like Breaking Bad and Justified. I like to walk my dogs. I like to go to the theater. I like to get dressed up and go out to lunch. I like to get dressed up and go anywhere, really. Especially if I can wear a hat. 7 Magic Islands: You’ve written more than 60 books, been involved in television production, established a publishing company…there are quite a few highlights in your career and big names on your resumé. Looking back on your career so far, what makes you most proud? Kimberly Morris: What makes me proud? Hmmm…I’m proud that I’ve had an opportunity to meet and work with so many talented and smart people – young and old, amateur and professional. It’s been an honor and a never-ending adventure. 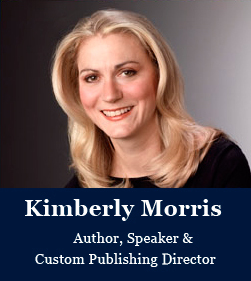 To learn more about Kimberly Morris, her books, presentations and Publishing Matters, visit her online at www.kimberlymorris.com or www.publishingmatters.com.